I know what many of you are thinking, “she is becoming some sort of creepy stalker taking pics of her neighbors’ garbage all the time”. Yeh, so what? Admit that you, too, take some unexplained pleasure in the oddities that I find lying out by the curb on Tuesdays, Thursdays and Saturdays. This one comes from my favorite house. These are the same people that brought us The Dog and Kandinsky , The Headless Garbage, and the ever famous VanGogh Vodka with frames. I don’t know who these people are but I really would like to be friends with them. For today’s shot I had to get off the phone to take the picture with my godforsaken Blackberry. As much as I cannot wait for the iPhone5 to arrive with its dazzling 8 megapixal camera, there is something fabulous about how this shot came out, don’t you think? 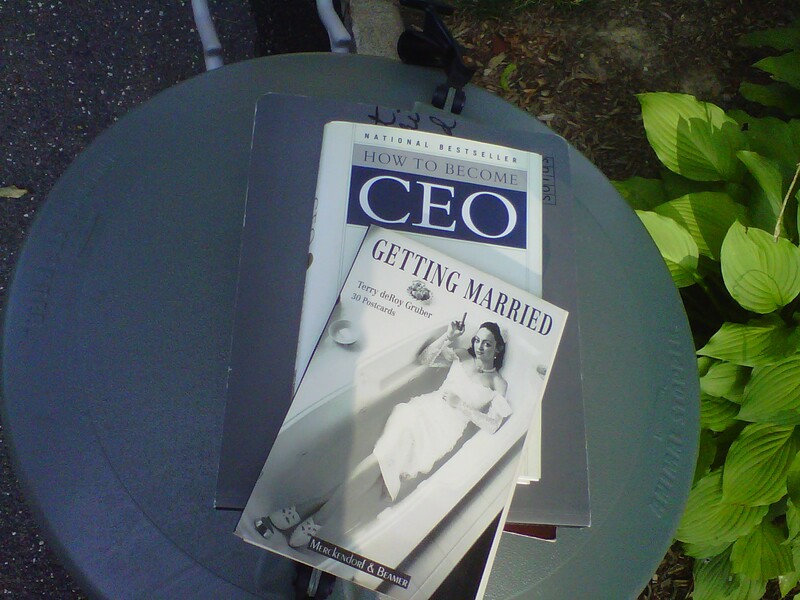 How to Become CEO and Getting Married… both in the garbage. So, do you think they have achieved both goals or have given up?